Make a Donation to Raleigh Rickshaw - The Raleigh Rickshaw Co. Thank you so much for donating to the Raleigh Rickshaw Cause and experience. While we are not a non-profit we rely heavily of donations from good folks that believes in aggregate change. todays donation will go directly towards Keeping Raleigh Rickshaw Safe , Fun and environmentally responsible. 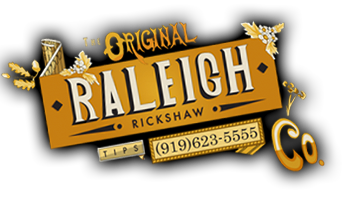 Since 2007 The Raleigh Rickshaw Co. has been providing Environmentally Responsible transportation to locals and visitors alike. As a private company we rely on our Downtown Advertisers' Sponsorships and Private Sponsorships to make our environmental impact sustainable. Please give what you can. During last 7 years The Raleigh Rickshaw Co. has been collecting detailed data on its Downtown Raleigh Fleet Services. Any single year of Raleigh Rickshaw Co. services surpasses the last FIVE years of R-Line Services, and at no cost to the tax payer. The Raleigh Rickshaw Co. Receives no funds from The Raleigh Downtown Alliance, City of Raleigh, or Triangle Transit Authority. -Total Miles Avg. - 2.62 miles/hour. -$177,805 in Gas not used by transporting people in motor Vehicles. -309,635.80 lbs. of toxic emissions were prevented from polluting the air.